Evolves the mode using a hyperspherical kernel defined by a radius (which is set by SetRadius) method. Recent API changes The static const macro MeasurementVectorSize has been removed to allow the length of the measurementvector to be determined at run time. It is now obtained from the sample set as input. The typedef for MeasurementVectorSumType has changed from FixedArray to Array. Definition at line 43 of file itkHypersphereKernelMeanShiftModeSeeker.h. Definition at line 80 of file itkMeanShiftModeSeekerBase.h. 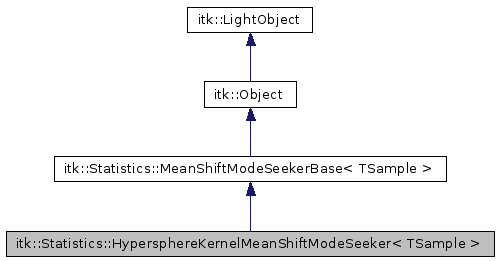 Reimplemented from itk::Statistics::MeanShiftModeSeekerBase< TSample >. Definition at line 51 of file itkHypersphereKernelMeanShiftModeSeeker.h. Definition at line 77 of file itkMeanShiftModeSeekerBase.h. Definition at line 62 of file itkHypersphereKernelMeanShiftModeSeeker.h. Definition at line 75 of file itkMeanShiftModeSeekerBase.h. Definition at line 69 of file itkHypersphereKernelMeanShiftModeSeeker.h. Definition at line 56 of file itkHypersphereKernelMeanShiftModeSeeker.h. Definition at line 50 of file itkHypersphereKernelMeanShiftModeSeeker.h. Definition at line 65 of file itkHypersphereKernelMeanShiftModeSeeker.h. Definition at line 61 of file itkHypersphereKernelMeanShiftModeSeeker.h. Definition at line 48 of file itkHypersphereKernelMeanShiftModeSeeker.h. Definition at line 49 of file itkHypersphereKernelMeanShiftModeSeeker.h. Definition at line 95 of file itkMeanShiftModeSeekerBase.h. Definition at line 84 of file itkMeanShiftModeSeekerBase.h. Definition at line 90 of file itkMeanShiftModeSeekerBase.h. Definition at line 102 of file itkMeanShiftModeSeekerBase.h. Definition at line 75 of file itkHypersphereKernelMeanShiftModeSeeker.h. Definition at line 87 of file itkMeanShiftModeSeekerBase.h.